Rahm has to know city finances will crumble when the nation’s economic rally ends. He only needs to look at how the city’s pension funds have done with the market’s winds at their back. The S&P was up more than three times from 2009 through 2017, and yet the city’s unfunded liabilities increased 2.75 times over the same period, largely the result of poor funding policies. 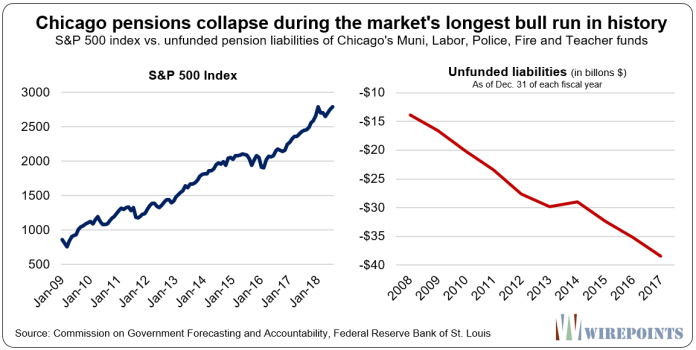 When the stock market rally started, the city’s unfunded liabilities, including those at CPS, were less than $17 billion. Today, they are at $38 billion. And those numbers are based on the official statistics – the rosy scenario. The pension shortfall is much larger – Moody’s pegs it at $67 billion – when more conservative investment return assumptions are used. What will happen when the markets reverse? Three of the pension funds are now just one serious stock-market correction away from insolvency – if they’re not already there. The police and fire funds are officially less than 25 percent funded, while the municipal fund has just 28 percent of the funds it needs. The city’s best-funded plans – the Laborers and Teachers plans – are less than 50 funded. The probability of a full meltdown when the next recession comes has increased. Reports on the city’s finances show that’s especially true when Chicago is compared to its peer cities. 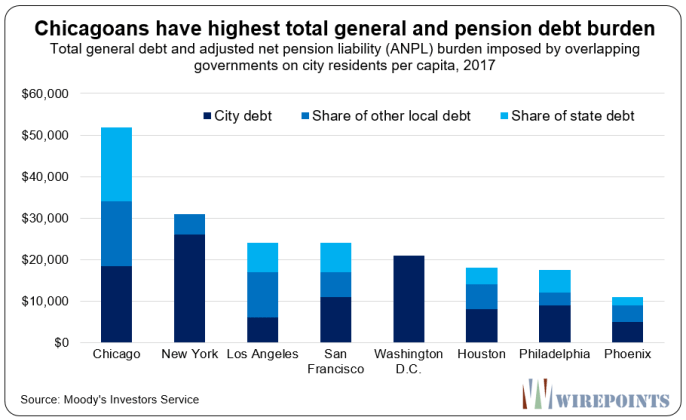 The debt burden is overwhelming to both Chicagoans and the city itself. 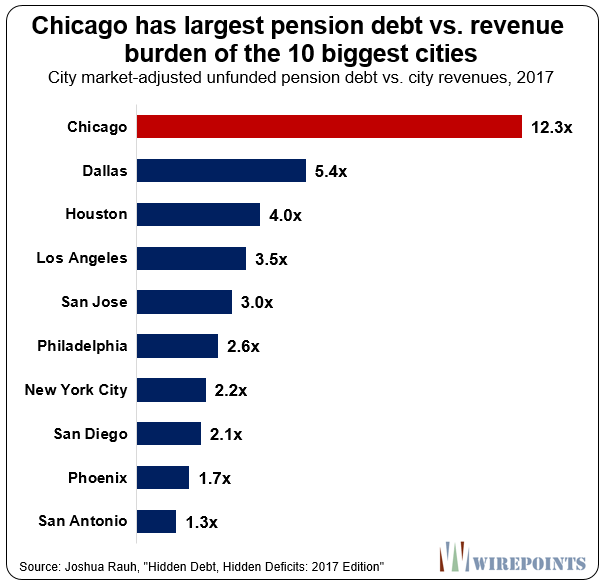 According to Joshua Rauh of the Hoover Institution, the city of Chicago’s pension debts, using market-based assumptions, are now 12 times the size of its annual revenues. That’s much larger than any other major city in the nation. Dallas’ pension crisis is deemed one of the worst in the nation, and yet its burden is less than half of Chicago’s. An even more pertinent comparison is the debt burden taxpayers face. 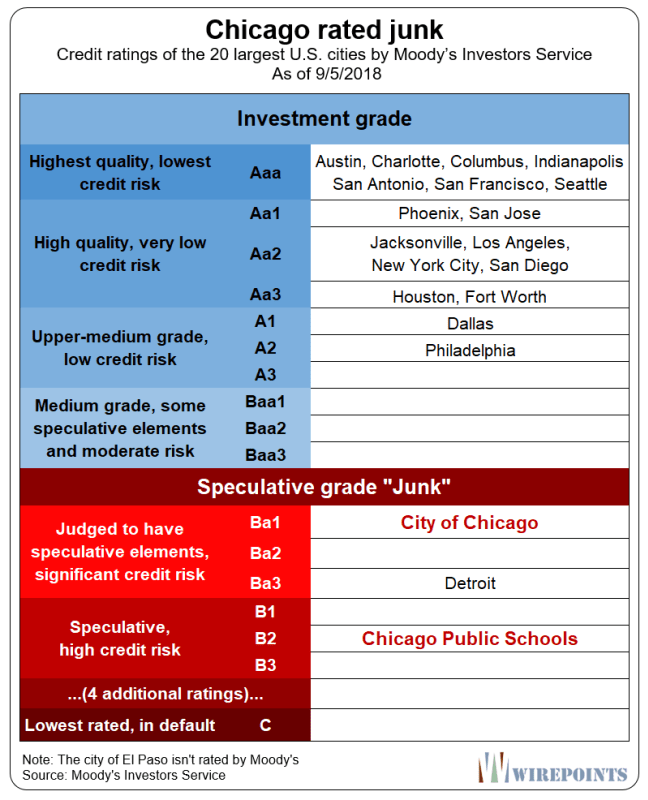 Moody’s published those numbers recently and Chicagoans are in real trouble. Every single Chicagoan is on the hook for more than $50,000 in debts, compared to just over $30,000 in New York and $25,000 in L.A. Residents in Houston, Philadelphia and Phoenix all face burdens lower than $20,000 each. Those per capita numbers, however, understate the true burden some Chicagoans will actually face. More than a quarter of the city is at or near poverty, meaning they won’t be able to pay much toward the city’s debts. That pushes the burden towards middle and upper income residents. And if the proponents of progressive taxes get their way – Ald. Ricardo Munoz is pushing for a progressive city income tax on those making more than $120,000 – the burden will fall on a much smaller segment of the Chicago population, say some 10 percent. In that case, the burden would equal some $500,000 on those targeted by the progressive tax. 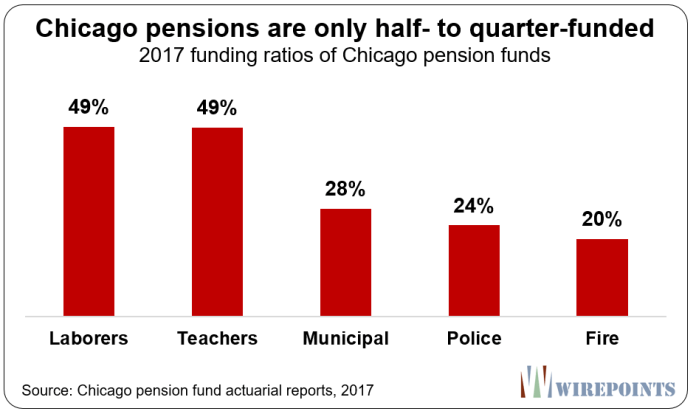 All this matters because, as we’ve reported in the past, Chicago has already raised all kinds of taxes to fund its pensions and close its budget holes. Taxes are up by more than $1 billion since 2015. The pressure for more tax hikes, absent any pension reform or concessions by the unions, will only increase as required pension contributions jump. Payments to the city’s funds are planned to rise by more than $1 billion in five years – nearly a doubling – and the city has no free cash-flow to cover them. What’s worse for Emanuel is that most taxpayers have figured out that most of the tax increases are being poured into old pension debt. Little, if any, is going to fund new services. That’s not good when you consider Chicago has been shrinking for decades. Those poor results are what recently led Emanuel to push for a borrowing “solution” that many have called a desperate and irresponsible can kick. Emanuel wants the state to borrow $10 billion and to pour that money into the city’s pension funds, with repayments of the bonds flung into the far, far future. The overall scheme is nothing more than a plan to gamble with taxpayer funds. Worse yet, he wants to use the city’s securitization scheme to entice skeptical bankers to accept the bond deal. That will require the city to sell even more of its future revenues – the public’s assets – and put future services at risk. In the end, Emanuel is hoping the influx of cash into the pension funds will bring down the city’s required contributions going forward. It’s all in an attempt to push a pension crash and tax hikes as far into the future as he can in order to protect his legacy. Never mind how bad all this will be for Chicago. You can’t help but wonder if Emanuel is stepping down because he can’t get the $10 billion pension bond deal done. The likelihood of the deal has dropped as more people realize what a kick-the-can plan it is. And without the scheme, the risk of a meltdown is real. That’s a risk Rahm is unwilling to stick around for. He doesn’t want to be the mayor that begs for a bailout, especially since he has ambitions for higher office. Emanuel will soon hand over the time bomb that is Chicago finances to his successor. Will that new mayor tackle the big and unpopular reforms by taking on the unions, special interests and crony businesses to bring the cost of Chicago government in line with what residents can afford? Or will their solution just be more tax hikes that destroy the city’s tax base? Chicagoans better hope, and vote, for the former. The bomb is ticking.